National Elevator Industry, Inc. has 75-year track record of positive impact. Organization is a leading proponent of safe building transportation for new and existing products and technologies. SALEM, N.Y. (March 31, 2009) - The National Elevator Industry, Inc. (NEII) is celebrating a 75-year milestone. Though incorporated on March 9, 1934, NEIIâ€™s origins can be traced back to the first joint meeting of elevator contractors that took place in 1914. NEII, formerly the National Elevator Manufacturing Industry, Inc., was formed by elevator contractors to create standard guidelines that promote safe building transportation. The association focuses on new and existing elevator products and technologies, as well as promoting the adoption of codes and specifications by local government agencies. As early as the 1930â€™s, the organization was instrumental in its negotiation of the Standard Agreement with the International Union of Elevator Contractors (IUEC) and later established the National Elevator Industry Health, Pension and Education plans. In 1934, the EMA became the National Elevator Manufacturing Industry, Inc. which it remained until 1969, when it reorganized once againâ€”becoming the current National Elevator Industry, Inc. (NEII). In 2002, NEII again reorganized, forming two different membership categories: Regular Members and Trust Members. NEII Regular Members focus on code, standards, safety, communications and government affairs, whereas the Trust Committee (elected by Trust members) is responsible for administering NEII rights and obligations regarding the National Elevator Industry benefit plan and educational programs. Over the years, NEII has continuously found ways to improve its services to make them as efficient and beneficial as possible for its members. In 2006, NEII developed a local code regulation database, CodeFinder, available on the NEII Web site to full regular members. The NEII CodeFinder database is an essential resource for elevator industry professionals in North America. It serves as an online catalog of elevator industry codes, standards and regulations, as well as modifications, local interpretations and historical data. The database has made it easier than ever for professionals to access codes and stay up-to-the minute on changes in codes. That same year, NEII was instrumental in the development of a code for new technologies with its creation of the Performance Based Code (PBC). NEII had proposed the PBC in 2002 to a joint meeting of the ASME A17 Standards and CSA B44 Technical Committee after observing challenges in the code enforcement process. 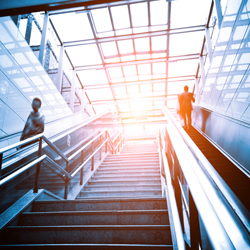 The existing Safety Code for Elevators and Escalators, ASME A17.1/CSA B44, contained prescriptive language to address state-of-the art technologies. Lack of a uniform process for assessing the compliance of new technologies indicated a need for a safety code that addressed these products. To this end, the PBC serves as a comprehensive method for specifying safety requirements for new elevator technologies. The PBC was approved by the ASME A17 Standards Committee in 2006. In 2007, NEII introduced a Web site dedicated to promoting the adoption of Performance Based Safety Code for Elevators and Escalators, ASME A17.7/ CSA B44.7 (PBC), www.pbc-elevators.com. The National Elevator Industry, Inc. is a national trade association that represents the interests of corporations, firms or companies that, as part of their regular business, manufacture elevators, escalators, or moving walks (including parts and components); or install, repair and maintain related equipment. Trust membership is available to those corporations, firms, or companies who, as part of their regular business, employ members of the International Union of Elevator Constructors (IUEC) and contribute to the benefit trusts (Trusts) established by agreements between the IUEC and NEII. NEII promotes safe building transportation and works with various organizations on the formation, adoption and enforcement of the latest codes and standards. For more information about NEII, log on to www.neii.org.